I typically like to cook from scratch for our meals. But let’s be honest. For all of us, sometimes there are ‘Those Days‘… Today is just such a day. I’ve been busy all week, I’m just getting over being ill and today I really need to play catch-up. So a hearty meal needs to be on auto-pilot today. Easy ’nuff, I decided to make taco soup. This soup is way too easy, y’all. It simply involves browning the ground meat, opening up a bunch of cans, dumping it all in the pot & waiting for the flavors to marry. You almost don’t even need a recipe for it. The abbreviated story: Brown 2 lbs of ground meat with onion & seasoned with a packet of taco seasoning. Then add the drained meat to a slow cooker along with a drained can of each: corn, black beans & green chiles. Add undrained cans of Ranch-Style beans, Rotel tomatoes, tomato sauce & beef broth. Turn your slow cooker to low heat and let it heat low & slow until you’re ready to eat. 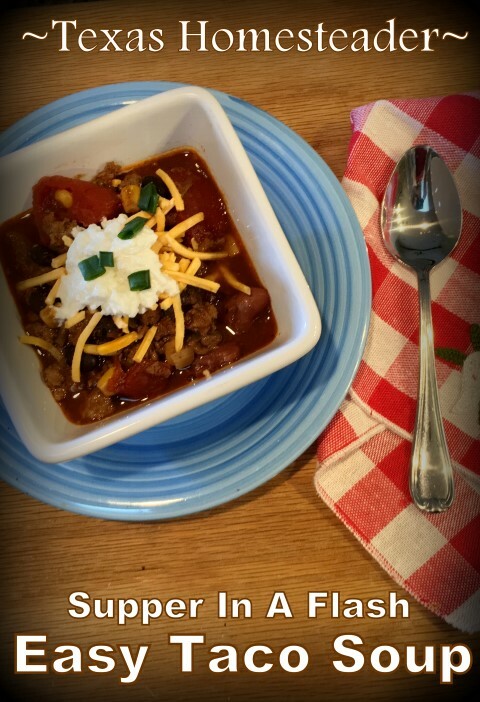 I scoop the hot soup into big bowls and garnish with either a little shredded cheese, sour cream, chopped chives, jalapeno or sometimes nothing at all. It’s delicious just the way it is! And it’s a great bone-warming option on a cold day. Saute chopped onion in a small bit of oil until translucent. Add ground meat and cook until no pink remains. Drain meat and sprinkle taco seasoning, blending together. Place drained meat and all remaining ingredients into slow cooker. Turn cooker on low and warm through. Serve soup in bowls. Top with garnish if desired: sprinkling of shredded cheese, dollop of sour cream, chopped chives or slice of jalapeno. 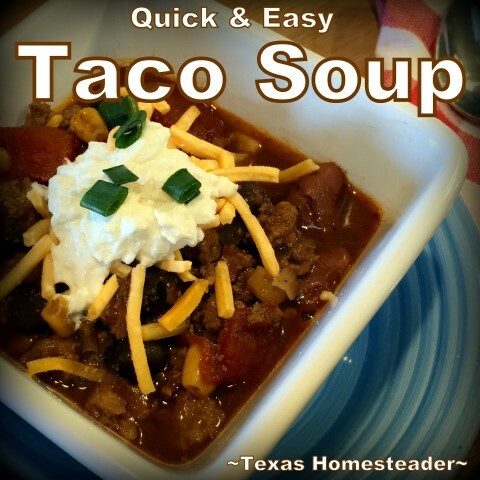 This entry was posted in Blog Posts and tagged Cooking, Recipes, Winter on January 27, 2019 by Texas Homesteader.